There was a time when it was easy for the average buyer to easily see the differences between custom and semi-custom cabinetry in the kitchen. Today however, many believe that just because they have been permitted to make a few upgrades and changes to stock cabinets, they are buying “custom” cabinetry for their kitchen. Such is not the case as these slight modifications are not enough to be considered “true” custom cabinets. In order to qualify as fully customized cabinets, everything from the size and shape, to the materials being used is chosen to fit within the confines of your kitchen. Typically every aspect of the cabinet including hardware and anything you might have built into a particular cabinet such as spice racks, plated slots, and cup hooks is designed specifically to meet your needs. The idea here is that your new cabinets are designed specifically for your kitchen. In fact unlike semi-custom cabinets that typically start with a base design, when ordering custom cabinets you will sit down with a designer. His job is to measure your kitchen and then work directly with you to create the perfect set of cabinets. This ensures that they are exactly what you want from the frames to the doors. 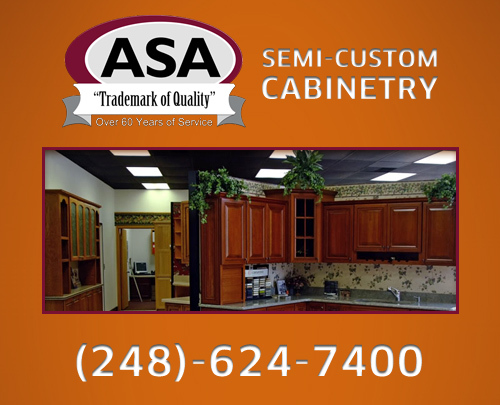 On the other hand when you order semi-custom cabinetry you are more limited in what modifications you can ask for. In general the actual boxes for each cabinet are premade in a number of standard sizes engineered to fit the needs of the highest number of buyers. You simply measure your kitchen and decide what sizes and shapes will best suit your needs. From here you can select the color or finish, the types of doors, and the hardware you want. This allows you to give your kitchen a custom look to suit your tastes at a more affordable price.